Many household or auto projects can benefit from using a can of spray paint, but finding the right brand for your needs can be confusing. Whether you are using it to cover some rust or just refresh the color, finding the best spray paint is a must. I’ve put together a comprehensive list for you of all the best spray paints currently on the market. This should help you to make the best decision for your projects. Before you purchase your spray paint, there are some things you will want to watch for. It will be important to purchase a spray paint that is ideal for whatever you are painting. When you are working on a bike, car or wall, there will be different paint for each project. Read all the information carefully to ensure that you are picking the appropriate choice. Choosing the right color is essential to completing a job that you will be proud of. It is easy to find just about every color imaginable, so be sure to take your time and match your colors wisely. How much surface area will you be spraying? This is an important factor when you are determining how much spray paint you will need. If you just have a small rust spot to cover, you won’t need a lot of paint. If, however, you are looking to redo a piece of patio furniture, you are going to need more paint. There are a variety of finishes you can choose from based on the project you are attempting to complete. Some of the most popular are high gloss or matte finishes. There are many reasons that people will opt for a spray paint versus the traditional paints. One of the most popular reasons is the ease of use. You don’t have to get out your paint brushes or rollers and there is no lugging large, heavy paint cans around with you. In addition, they are easy to store when you are done using. Spray paints are also quite versatile and can be used for a variety of projects. Many people use the spray paints outdoors where the extra spray won’t damage any other items, but it is possible to complete projects indoors as well with the proper ventilation and precautions. Auto enthusiasts enjoy using spray paint under the hood and even on the interior of their vehicles to reduce rust, improve appearance and give an updated look. You can find spray paints that work on a variety of materials including wood, metal, and plastics. It is even good for craft projects you might want to complete. Here’s a comprehensive list for you of the best spray paint brands available plus my pick for the best product from each brand. This company is one of the oldest and more reliable available for your spray paint needs. Their products tend to dry well and spray evenly. The cost of most Rust-Oleum spray paints is low compared to other brands, but it doesn’t seem to ever affect the high level of quality. Rust-Oleum 7578838 Professional High-Performance Enamel Spray Paint is my number one choice when you are in need of quality paint for a multitude of materials. It can be used to spray on ferrous or non-ferrous metal, wood, masonry, concrete and many other surfaces. You’ll find that it provides not only superior rust protection but also a tough and attractive finish that can stand up against time and weathering. This high-quality, oil-based, durable formula will maintain a consistent and corrosion-resistant color no matter what gets thrown at it. You can use one can to effectively cover up to 14-square feet of space. In addition, the coat will be dry to the touch in just 15 minutes. If you want to add a re-coat to your project, simply wait an hour before spraying again. What a time saver! What I love about this spray is that it comes with a high output tip that can be used at any angle. You will receive the same quality of spray even if you have to turn the can into strange positions to reach tight spaces. It is an effective commercial and industrial paint formula. Ideally, you could use this spray for products in a demanding, heavy-use environment because the color will not fade over time. In addition, the flat finish helps to hide any surface imperfections making the completed work look exceptional. This company was founded in Germany and is one of the best on the market. They offer durable paints in a variety of colors. You might notice that the price on the Montana paints will be slightly higher than many other brands. Montana GOLD Acrylic Professional Spray Paint is one of the more popular choices they offer. It is a flexible, acrylic-based matte formula designed for wood, metal, plastic, canvas, glass, concrete and more. This provides an opaque coverage and is considered to be lightfast for a minimum of 10 years. The spray can features a level cap system which allows for both low and high-pressure performance from the same can. By changing out the caps, you can use the low-pressure output when painting thin or fine lines to high-pressure output for filling in larger spaces. This is also great for indoor work as the atomized spray is reduced and there is virtually no odor. Krylon was the first company to produce many of the innovative products we use today. They are a leader in color, package design, innovation and inspiration. The K05151202 Flat White Interior and Exterior Decorator Paint provides an elegant design and finish to many materials. You can use it on wood, metal, glass, paper craft projects and wicker. It also features an EZ Touch 360-degree dial spray tip for ease of use. The non-yellowing moisture resistant finish also offers permanent protection for bare and painted surfaces. This formula even dries to the touch in just 10 minutes or less. Since 1923, PlastiKote has always been looking for ways to make a better product. You’ll find a wide variety or solution-specific products to fit your unique needs. PlastiKote 215 Low Gloss Black Engine Enamel is the product you’ve been looking for when working on engine restorations that require a tough, high heat finish. The exposure to engine heat will fuse the enamel to the surface and increase the bonding strength of this spray. It is fully resistant to oil and gasoline, plus it will not weaken, lift, crack or peel over time. You can choose from a variety of colors and it is simple to use. It also dries into a rugged finish that tops off any car project. You can choose from a variety of colors and it is simple to use. It also dries into a rugged finish that tops off any car project. When you are working on automotive projects such as refinishing wheels or upgrading your interior, Dupli-Color is a brand you’ll want to know. They’ve been developing products since 1938 and have many of the industry’s innovative firsts. Dupli-Color HVP106 Flat Black High-Performance Vinyl and Fabric Spray offers maximum adhesion with no primer needed. It is fast drying and won’t crack, chip or peel. You can use this to paint your old interior vinyl and fabrics. Consider refinishing your vinyl seats, door panels, shifter boots, dashes and consoles with the variety of colors that are offered. This company began in a Pennsylvania garage in 1958 and has grown to a manufacturer of over 1,300 items. Whether you need automotive, marine, heavy truck or hardware needs, CRC has what you are looking for. CRC All Purpose Enamel Spray Paint offers superior enamel formulation providing a glossy finish, durability, and flexibility when compared to your leading lacquer paints. It is resistant to peeling and chipping for maximum life. In addition, it will dry tack free in 10 to 30 minutes and fully dry in less than an hour. It offers suitable resistance to corrosion, abrasion and solvents. You can use this spray in everyday factory or contractor applications. For over 200 years, Valspar has been offering some of the most recognized paint and coatings to the world. They offer a wide variety of colors and materials to perfectly complete your projects. Valspar 21928 Gloss Enamel offers a wide variety of colors to choose from and is UV resistant. It is also water resistant and will not fade or start to yellow over time. It can be used indoors or out with metal or wood and is a tough brand that resists scratches. Since 1946, Seymour has been manufacturing paints for the automotive, industrial, marine and hardware industries. They have a staff of 150 employees which include three full-time chemists. All of their paints are produced in a state of the art manufacturing plant in the United States. Seymour believes in taking care of the world. They’ve developed coatings with waterborne and high-solid resins to use instead of traditional solvent-based polymers. Their products will not contain any lead, mercury, cadmium, chromates or chlorinated solvents. Seymour EN-66 Hi-Tech Engine Spray Paint offers a special formulation for close work applications. The superior coating provides maximum durability under stress conditions. You can easily restore the original factory color to your engines, transmissions and other OEM equipment on your automobile with this spray. It is heat resistant up to 300-degrees Fahrenheit as well as VOC compliant. In addition, it is chemical and gas resistant making it the perfect option for working on a vehicle. Since 1978, Eastwood has been a strong presence in the DIY community at car shows. They currently offer over 4,000 products to get the job done right. They offer in-house product design, testing, and development while always offering their customers the highest level of quality and innovation. In addition, their products come with a 100% satisfaction guarantee to give you peace of mind. Eastwood 10024Z Black Underhood Paint is a fantastic paint option for use under the hood of your vehicles as well as the interior components of an automobile. It is durable and dries with a smooth, satin finish. You can use this to protect from rust and corrosion and it is a fast drying formula. The market is filled with high-quality brands that manufacture spray paints. The ultimate choice is truly up to you to decide what will be best for your specific needs. Choose a brand with a great reputation, be careful when selecting the color you need and then, get painting! 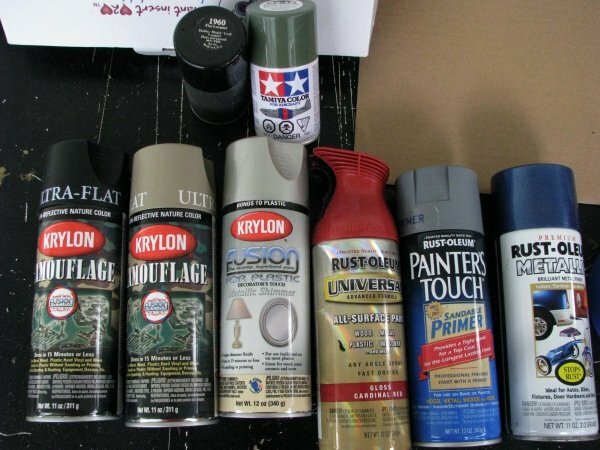 Very clean and Informative article on Spray paints.